The Business Office has for its primary objective the safeguarding of school’s resources to ensure that these are accounted for according to the purpose for which they are intended. • To intensify spiritual and personal development of the staff. 1. Modes of Payment may be in full or in installment. 3. The Business Office will automatically cancel the Official Receipt and the Enrollment of those whose checks were returned/dishonored by the bank. Replacement for returned/dishonored check shall be in cash, credit card, or manager’s check and shall be paid at the Business Office – Cashier’s Window only. 4. For installment payments, issuance of Post Dated Checks (PDCs) with the fully accomplished PDC Warranty Form is required. 5. Read the PDC Warranty Form carefully. 6. Full payment thru BDO on line payments may be viewed by the Business Office only on the next banking day. Those who choose this manner of payment are advised to remit a day before the scheduled enrolment. 7. Use only Bills Payment Form when paying through any BDO branch. Do not use ordinary deposit slip. 8. Students with 12 units and below are required to pay in full upon enrollment. 9. Grantees/Scholars may pay their counterpart in full or in installment plus PDCs. 10. Students with outstanding balance will not be allowed to enroll before full settlement of account. 11. One-time payment amounting to $500 will be charged to foreign students on their first year. This may be paid in peso currency applying the prevailing rate advised by the Business Office. 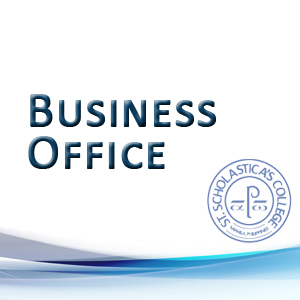 The Business Office will appreciate accepting your payments through DIRECT PAYMENT to the Business Office at Window 2. 1. For those who opt to pay in full during enrolment through the Banco de Oro (BDO) Bills payment facility, visit any BDO branch nationwide and accomplish the designated Bills Payment form. 3. Pay over-the-counter and get your validated copy of the Bills Payment form. 4. Observe the cut-off for Local Checks clearing before 3:00 p.m. Checks paid beyond 3:00 p.m. will be posted on the next day. 5. Present the validated payment slip to the school cashier to get your Official Receipt. Please refrain from using Ordinary Deposit Slip. 1. On the same day if CASH payment is made and the validated payment slip is presented to the cashier. 2. On the third (3rd) banking day for CASH payment if no validated payment slip is presented; also for LOCAL CHECK payments. 3. On the seventh (7th) banking day for check payments with REGIONAL clearing. • The authorized signatory must sign any check alteration. • The student’s name and student number should be written correctly at the back of the check. • The Business Office will automatically cancel the Official Receipt of those whose check were returned/dishonored by the bank. • Replacement for returned/dishonored check shall be in cash, credit card, or manager’s check and shall be paid at the Business Office – Cashier’s Window only. • Any Mastercard or VISA card is acceptable as mode of payment for tuition and fees. Only one (1) swipe per card and up to a maximum of two (2) cards is allowed per student. • Payment through credit card may be made at the Business Office – Cashier’s Window only. • Payments through ATM via debit to savings account are acceptable as mode of payment for tuition fees. • The payor should not forget to get the second copy of the validated Bills Payment Slip from the teller as proof of receipt of payment. • Transmittal of Bills Payments may be viewed by the Business Office only on the next banking day. Those who choose this payment scheme are advised to remit a day before the scheduled enrolment. • The Official Receipt will be available for pick-up at the Business Office – Window 2 after three (3) working days after the Business Office receives a transmittal report from the bank. • Student with 12 units and below are required to pay in full. • Issuance of Post-Dated Checks (PDCs) with the fully-accomplished PDC Warranty Form is required. • Read the PDC Warranty Form carefully before filling up. Print is duplicate.